Sign up for free and just shop with Rentalcars.com as normal. Our members earned £10,000+ at Rentalcars.com in the past month. Rentalcars.com cashback can be earned simply by clicking through to the merchant and shopping as normal. Rentalcars.com Cashback is available through TopCashback on genuine, tracked transactions completed immediately and wholly online. Book cheap car hire deals to suit your budget with the world's biggest online car rental service and ensure you get great rates with our Rentalcars.com discount code deals. Whether you are looking to hire a vehicle in a UK city, such as Manchester or London, destinations in Europe, like Ireland, France, Italy, Cyprus and Malaga in Spain, or international car hire locations, you can arrange a pick-up from almost anywhere. If you have booked flights abroad with one of the leading or budget airlines, you can collect vehicles from a huge selection of airports to use to drive to hotels or for sightseeing while you are there. Just enter a city, airport, station, region or district to find your ideal location, select the date and time of pick-up and drop-off and enter the driver's age to find deals from leading car hire companies like Alamo, Hertz, Avis and United Rent A Car. When making a reservation, you can request optional extras such as a GPS, which will allow you to map your route. Join Rentalcars.com and you will be able to take advantage of exclusive deals and great money saving offers. As well as gaining access to these promotions, you will also be able to manage all of your car hire bookings in one convenient place, book quicker thanks to the fact you can store payment and driver details and compare multiple quotes to ensure you are getting the best deal available. The secret deals you will be offered could include being able to add an extra driver for free with every booking at all locations in a particular country or a 10% discount on already cheap car rentals in a selected country, be it Australia, Canada or Germany. As well as offering economy and family hire car options, you can also arrive in style by finding the ideal luxury car for you and getting a great price for hiring an Audi, Porsche, BMW or Cadillac. This service is available in approximately 180 countries around the world, meaning you could benefit from the best deals if you are looking to hire something special in the UK, the USA or Spain. Once reserved, you will benefit from a smooth and quiet ride, a stylish and spacious interior and the latest technology and safety features, all of which will ensure you will travel to your business meeting or formal occasion in comfort. They offer superb deals - many of which are exclusive - on an extensive selection of luxury cars. Search for and compare deals for high-end vehicles and book one in more than 46,000 worldwide destinations. If you are looking to hire something which will be great for a summer road trip, you will find plenty of convertibles which are fun to drive in many locations. Booking a convertible will allow you to go for an exhilarating drive in the sun knowing that if the weather suddenly changes, you can put the roof up and continue on your journey. The feeling of space you experience when driving a convertible makes you feel part of the surroundings, while you will also benefit from the increased visibility, which is great for both safety and enjoying the view. Whatever the occasion, hire an Audi A5, Mini Cooper or Vauxhall Tigra and make the most of your drive in the sun. If you are needing to travel with the family or a large party, you will be able to take advantage of Rentalcars.com deals on seven and nine-seater cars, as well as 12-seater minivans, which offer plenty of space for passengers and luggage. Models such as the Renault Scenic and Vauxhall Zafira offer the latest technology, including advanced safety breaking and features which will help improve the vehicle's handling. Take advantage of higher seating positions and seats which can be folded down to provide the perfect seating arrangement for the number of people and the amount of luggage you need to fit in. As the world's biggest online car rental service, they work with leading car hire companies worldwide to negotiate great prices which are only made available to Rentalcars.com customers. As a result, they are so confident they will not be beaten on price that they offer a price match guarantee. The car rental providers they work with offer them lower prices due to the amount of business Rentalcars.com put their way. As a result, once they have covered their own costs, Rentalcars.com are able to pass a saving on to their customers. Should you find a lower price for a comparable car rental deal, provide Rentalcars.com with the name of the competitor, the price they are offering and when and where you saw the deal, and they will match the rate. This guarantee only applies to prepaid rentals offered on like-for-like car hires by other independent UK car rental operators using comparable suppliers. The term like-for-like covers both product and service. For example, if the other price is for a rental off airport and the Rentalcars.com deal is for on airport, they will not price match. The guarantee also does not apply to promotional offers or vehicles which have an 'on-request' status, either with Rentalcars.com or the competitor. Drivers can take advantage of the price match guarantee either ahead of or after making a rental car booking, as long as it is before the date when the rental starts. 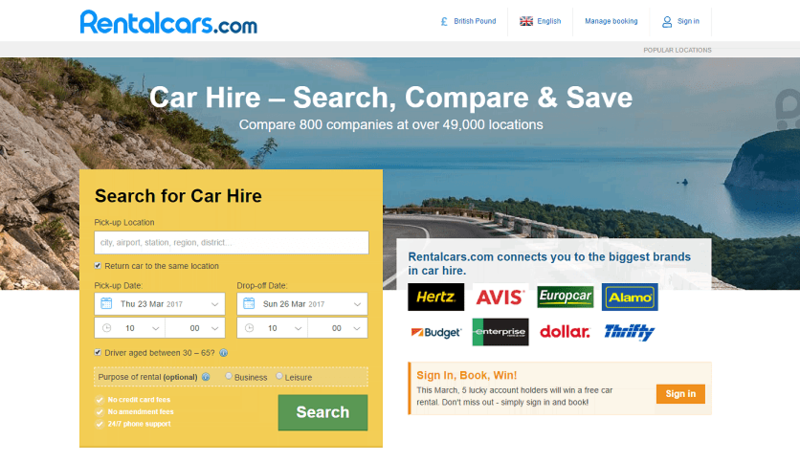 Arranging car hire in 167 countries and 40 languages, Rentalcars.com is the world's biggest online car rental service. Working with leading suppliers, we offer great prices on all car groups, including luxury cars, people carriers, minivans and automatic cars. With a multilingual call centre open 7 days a week, we can find you the best rental prices whenever you want – wherever you go.